They could be a wonderful new thing to add. I've always felt the absence of quality outdoor maps in Nexuiz, and imo a wonderful change to bring with Xonotic would be some good outdoor maps with terrain, trees, cliffs, etc. This was more difficult in the past when terrain had to be generated from a heightmap. Now that the engine handles patch terrain much better (no more deadly FPS when shooting it, or projectiles falling through it most of the time) I think that good terrain maps are one step closer to being possible. Although NetRadiant patches aren't as good as terraformable terrain, I'd imagine such maps close to the model in UT, such as http://i32.tinypic.com/111nrwp.jpg or http://utforums.epicgames.com/showthread.php?p=25710217 (see screenshots). Antalus in UT2004 is an outdoor map style I like. Arboria gives a good taste of how outdoor maps would feel in Xonotic (the map is not free as it's ported from UT, though some content in it might be). If something like this is to happen, I believe Xonotic would need more outdoor content first. From what I seen while mapping there is lack of models and sounds for outdoors. More tree and plant models would be very needed, followed by some good rock and cliff meshes. For sounds, I'd find bird and cricket noises useful, as well as more wind and watery sounds. If that's in place I think a lot of outdoor maps can be made easily. This would be great. I have tried some open maps myself but lack the frames to finish and submit a playable version . I worked on golf course type map with ponds and a windmill before . maybe now i can try a test with patch mesh . I would like to suggest a thread dedicated to GPL models for folks to post for use and maybe another for new textures . Quote: (the map is not free as it's ported from UT, though some content in it might be). I'm pretty sure Arboria was built from scratch by torus. I remember it because he was in my clan around that time. Arboria was a great looking map, but had some gameplay issues and some FPS issues. It was quite large in scale. It did show some possibility of what can be done in the game. I think the main problem with huge open areas in nexuiz is the lack of "cover". You can't evade machinegun, shotgun, crylink or nex. You're almost always exposed. (03-21-2010, 08:29 PM)Dokujisan Wrote: I'm pretty sure Arboria was built from scratch by torus. I remember it because he was in my clan around that time. Arboria was a great looking map, but had some gameplay issues and some FPS issues. It was quite large in scale. It did show some possibility of what can be done in the game. I think the main problem with huge open areas in nexuiz is the lack of "cover". You can't evade machinegun, shotgun, crylink or nex. You're almost always exposed. Sorry, its UT name is Tokara Forest, the port was named Arboria. I remember Torus (or someone else) mentioning they re-made it from a scratch for Nexuiz, but it's still (representation wise) the UT map. 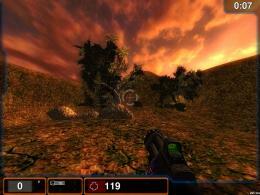 This is a screenshot of the original one (UT2k3 / UT2k4). I remember clearly it's an official map... I'd be amazed if I could actually forget this Still, we can make a similar map. And Grasshopper, I tried making some terrain maps a while ago as well, but none of them succeeded well. If there will be good content I'll try harder this time... my mapping experience improved since then too. Tree 1, Tree 2, Tree 3, Tree 4, Tree 5, Tree 6.
cool . thanks for the links . but are we able to use these even though they are dual licensed . more specifically can they go into a xonotic release? (03-21-2010, 09:07 PM)Grasshopper Wrote: cool . thanks for the links . but are we able to use these even though they are dual licensed . more specifically can they go into a xonotic release? Afaik there's no problem with dual licensed content as long as it's also GPL. Just what I remember... we already have warpzonelib which seems to be dual-licensed. If not, at least Tree 3 from my links is public domain, though it would need some changes (the leafs are so high-poly you even get low FPS in Blender). Suburb city maps might be fun too. We have Capturecity, but that's about it, and all it has are skyscrapers(kinda). Yeah, city maps are another thing we lack imo. I thought about them too, but once again we lack content (wall textures with windows, graffiti walls, or ambiental city sounds). If there will be content I'd love to try making some, as with the outdoor maps. (03-21-2010, 08:29 PM)Dokujisan Wrote: I'm pretty sure Arboria was built from scratch by torus. I remember it because he was in my clan around that time. Arboria was a great looking map, but had some gameplay issues and some FPS issues. It was quite large in scale. It did show some possibility of what can be done in the game. I made a revision (v2r4) from torus' version, adressing the performance. The paths are completely new, overall reducing the triangle count by about 65'000. I don't know to what extend it was remade from scratch by torus, I reused several of his models and textures. Obviously I license(d) my part (paths) under the GPL. I kept looking at the new Xonotic maps which are currently in the making. It seems we're starting to have several good indoor maps, yet no news about outdoor ones yet. I'm still hoping that in the end, Xonotic might have a variety of both. So it felt like a good time to revive this thread, and maybe spark some ideas and hope, now that we have more maps and a better defined style. The only final outdoor map that currently seems to exist is my port of Lord Of The Moths (a community UT2004 map). It's posted on the autobuilds server. I had a few other attempts, but they are unfinished maps that only have a basic terrain layout. I did post a few screenshots at the time, however. * To make a map that has terrain as the dominant surface, with little or no architecture. If any architecture is to exist, the best style would be something nature oriented. Terrain should best be a patch mesh (so it can look smooth and be edited in NetRadiant), though model and BSP terrain can work too if quality is high enough. * Using at least two textures on the terrain surface. Such can be easily achieved with the shader method seen in terrain01x, which blends one texture horizontally and another vertically. * Having enough detail, including plants (grass and small plants), and if possible trees. It could also have cliffs and rocks, which can be achieved with patch meshes and bevels / endcaps easily. * Guarded edges, so the player can't see the "end of the world" and reach the border where the the terrain ends. 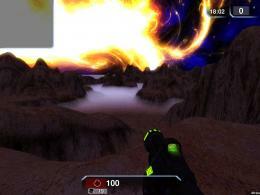 This is usually done with cliffs or big terrain heights near the edge, that the player cannot jump over, and are also limited by player clips. I'm hoping any mapper out there would be willing to try such a thing sometime. I still have plans to later on. I hope that over the next months, someone might come up with something to fill this artistic gap that I believe is missing from Xonotic maps. Those screenshots look pretty sick, I especially like the way the fog was used in the second one. Haven't seen many games after Turok 2 and Unreal (original) try to do anything like that. Since today spring started and I was playing more Xonotic, I was wondering about some nice green outdoor maps again. Found this thread I made on google, so I thought why not revive it to see if more maps of this type were made. Sadly I couldn't find any, but some attempts have been done since last time. There's Gaya which I couldn't find a topic of but should be available on the bsp-autobuild page... incomplete I think but still good. Also two awesome CTF maps called Unsealed Trial 2 and Top Of The World... I tried them shortly and they're on the right idea IMO. AlienArena has got quite a few of semi-outdoor maps that look realy good (total anhiliation is an example of what i mean, althought i am not sure if it fits under outdoor) (even with not-the-best-looking-textures) I have tried to import their .bsp's but it didn't work, so i'll try to get my hands on .map's. I have been working for one on and off for a long time now, but progress is awfully slow since I have so little time to work on it. For ideas on outdoor maps, I think it would be a good idea to get some inspiration from StarSiege: Tribes and the like. Xonotic's movement actually supports a faster style of play than Tribes does and if the map Evergreen (which was actually a Nexuiz map) is any indicator, large open maps would rock as they would do what Tribes does in Xonotic, but better. The potential for some Tribes style gameplay has already been shown with base assets (turrets, generators on Newtonian Nightmare), rolling terrain that promotes skiing (CTF Evergreen), and vehicles. Throw in some recharging jetpacks at spawn and you have a faster version of Tribes with Xonotic's weapons and no stupid two gun limit or class-based crap.